August 26 was Women’s Equality Day – a day set aside each year by congressional resolution to commemorate the date U.S. women got the right to vote through the passage of the 19th Amendment. However, as great and hard-won an accomplishment suffrage was, it hasn’t quite yet translated into true equality for women. But I don’t mean to be a total downer here. Instead, let’s take a page from our suffragist sisters’ playbook. How does their battle inform the ones we're currently engaged in, and those yet to come? First, though we take only a day to commemorate suffrage, of course, suffrage was not won in a day. It took another 72 years after the historic Seneca Falls Convention in 1848 before the 19th Amendment became the law of the land. Change takes time – and persistent pressure. Second, the suffrage movement first took root in the states before succeeding nationally. When Washington State became the fifth state in which women gained suffrage, it was a tipping point in the national suffrage movement. So what happens in your state, county, or neighborhood does matter. Let a thousand flowers bloom. And finally, let’s not forget what the fight for suffrage was all about. Suffrage is not just a symbol of equality: it is the means to equality. We can honor those original suffragists by taking up the torch and actively working to build a better future for all. If you haven’t already, check out – and sign – our Women’s Bill of Rights. And let us know what equality means to you. p.s. 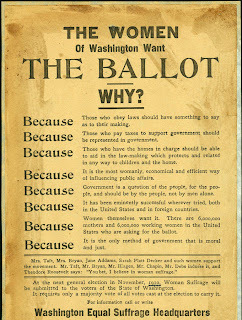 Oh, and the title of this post – “It’s a Matter of Justice?” That was the official slogan of the Washington State suffragists. Some things, we don’t need to change at all. When does a free market not equal a free ride?